Asparagus season is one of the best seasons, if you ask me. It signals the imminent arrival of the other excellent food seasons, new potatoes, strawberries, peaches, all the summery good stuff. And it really does taste like spring. Green, fresh, crunchy (none of that soggy boiled stuff, thanks) and light. Have it as a starter, a side, or like this as the main event. 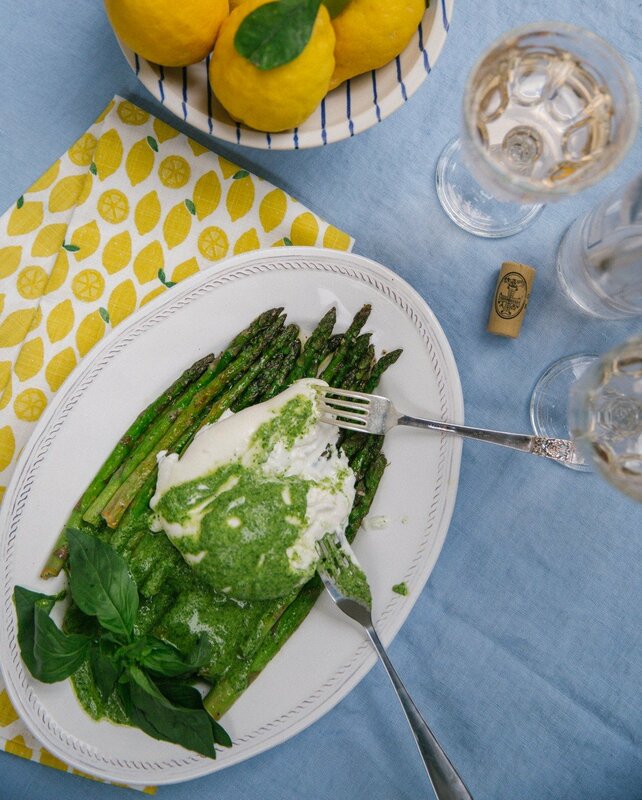 Topped with rich, creamy burrata and a generous dollop of freshly made, bright, zingy pesto. Start by making your pesto, you can also make this a couple of days in advance if needed. Blend your basil, garlic, pine nuts, cheese, oil and lemon together until smooth. If it’s looking a little thick, add more oil. Finish with a pinch of salt ‘n’ pepper. Place on one side. Now get a pan nice and hot, turn the heat down to medium and throw your asparagus in. Drizzle with a little olive oil (a couple of tablespoons at least), squeeze over a lemon and toss. Get it all nice and glossy, then sprinkle liberally with salt & pepper. Keep tossing around for a couple of minutes. The tips will begin to brown and everything will soften ever so slightly. Serve before it gets too soft, you want a bit of crunch. Top with a burrata, then a few scoops of pesto. Pour yourselves a glass of something cold and tear into that bad boy. Let the creamy middle spill out all over the shop, and mop it up with asparagus. Which, in my opinion, is far superior eaten using your fingers rather than knives and forks.